The hexagonal box in the picture below was designed by Tomoko Fuse. The elongated shape of the box is very elegant. As a bonus, it's not difficult to fold. 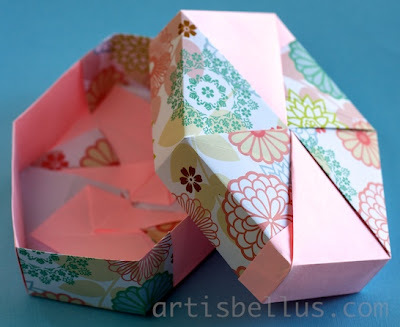 The diagrams can be found in Tomoko Fuse's new book, Beautiful Origami Boxes. I folded it with 6" (150 mm) squares of scrapbook paper, 4 for the lid and 4 for the base of the box.